Iron Speed Profile - Custom Cable Configuration, Datacomm Cables Inc.
"We estimate we saved $5,000 in development costs." The Custom Cable Configuration application was created for Datacomm Cables Inc. to reduce the number of customer service calls and enable 24-hour ordering capabilities. Datacomm Cables Inc. is one of the largest custom cable suppliers in the United States. 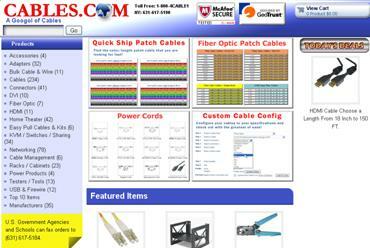 The application is used internationally by customers placing orders at Cables.com website. Some internal staff members perform administrative tasks, such as updating price lists, product availability, shipping charges, etc. ; however, the real user base are Cables.com customers. Prior to implementing this application, the company was only able to process complex quote requests by hand. Since there are many variances in price based on type of cable, length of cable, connectors, boots, etc., clients had to call customer service for assistance with a quote. Obviously, this was an inefficient and inconvenient method of creating quotes. The Custom Cable Configuration application allows Cables.com customers to enter their exact specifications on the website and get an accurate quote without interacting with customer service. The application not only streamlined the order process; it also opened up international ordering for Datacomm Cables. Custom cables can now be ordered around the clock rather than just during US East Coast business hours. The application is part of the ordering process and allows a customer to enter a custom cable order. Each response from the user creates a custom prompt for the user's next input. The end result is that the application calculates the cost of creating the cables in the appropriate color, with connectors attached and shipped to the customer's location. The customer can compare various order profiles and then place an order for the desired product. A customer looks at the product catalog if necessary. Most of the customers placing orders at Cables.com already know exactly what they want to order and are just interested in getting an accurate quote. 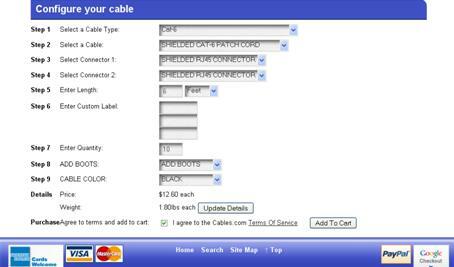 The customer starts out by selecting the cable type. Once the type is selected, a specific cable can be selected, along with different connectors installed at either end. A length is then selected, custom labels (if desired), as well as boots, color, and number of cables. When all the information is entered, the application calculates the price and the weight of each cable for shipping cost calculations. The customer can then revise the selections to get a different quote or elect to add the product to the shopping cart and place the order. The Custom Cable Configuration application utilizes one Microsoft SQL Server database, 10 database tables and five database views. Since the database has been normalized, the largest number of records in any table does not exceed 5,000, but the combination of tables can provide more than 1 million options in custom cables. The application has approximately 21 web pages; however, 20 of them are part of the back-end and only one is visible to the public. It is hard to estimate the number of application users; however, 1,000 custom cable configurations are processed each month. The project was completed and implemented in less than a week, by one developer using Iron Speed Designer. We wrote approximately 100 lines of code customizations, which took one day. We used several third-party software development kits (SDKs) to incorporate the e-commerce portion of this project. We created our own .NET themed page style in Iron Speed Designer. The entire project was completed in record time — one week — by using Iron Speed Designer. We estimate we saved $5,000 in development costs. The project would have been feasible without Iron Speed Designer, but would have taken twice the amount of time, and the costs would have risen as a result. Datacomm Cables plans to extend the application by building more configurators for other custom solutions they sell. For example, they'd like to add an application for Custom Cabinet orders. Extending the application will require us to add more users and deploy to additional websites.